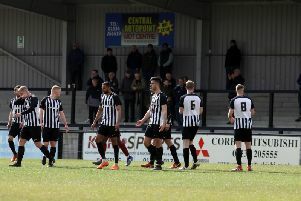 Kern Miller and Jack McGovern have both left Corby Town. Centre-half Miller was named club captain at Steel Park at the start of the season after signing a contract but he has opted to join Vanarama National League North side Gainsborough Trinity for an undisclosed fee. Frontman McGovern, meanwhile, has re-signed for the Steelmen’s Evo-Stik League South rivals Lincoln United with “work commitments” being the reason why he has rejoined his hometown club. Corby boss David Bell also confirmed this morning (Tuesday) that goalkeeper Paul Bastock is facing a spell on the sidelines due to a calf injury. And that has prompted the Steelmen manager to move for two young loan signings from Mansfield Town. Goalkeeper Sam Wilson has joined on a month-long deal from the Sky Bet League Two side while young frontman Zayn Hakeem has also arrived for the same length of time, having already had a loan spell at Matlock Town this season. Both players are now in line to make their debuts when the Steelmen take on Peterborough Sports at Steel Park tomorrow night.